The year, brethren, was 1848. It was a year of chaos, struggle, conflict and revolution for many people throughout the world. This was not to be the case, however, in Reading, Pennsylvania. In Europe, the late 1840’s brought about a Depression in many areas that lasted several years. Angry and suffering citizens had had enough by March of 1848 and revolutions began in many places including Vienna, Rhineland, Berlin, Milan and Venice. As armed conflict broke out in these regions, several men in Reading, Pennsylvania wished to further the ideas of brotherly love, relief and truth. As we have it today, the minutes of the Grand Lodge of England for June 5th, 1730 show that Daniel Coxe, Esq. was made Provincial Grand Master of the Provinces of New York, New Jersey and Pennsylvania in America. The first official Grand Lodge on record in Pennsylvania is dated from June 24th, 1731 with William Allen as Grand Master. It never had more than four lodges under its jurisdiction and was not very active as such. In the UK in 1751, a rival Grand Lodge was formed with the name “The Most Ancient and Honorable Fraternity of Free and Accepted Masons”. Calling themselves “Antients” and the existing Grand Lodge “Moderns”, the new Grand Lodge set out to gain support. The Antients were upset that the Grand Lodge had erased the ancient charge “to be true to God and Holy Church” and substituted “obeying the moral law; never to be a stupid atheist nor an irreligious Libertine; that is to be good men and true”. This charge was of extreme importance for it founded modern speculative Freemasonry on the rock of non-sectarianism and the brotherhood of all men who believe in the Great Architect of the Universe. It eliminated any discrimination based upon the name of God or in the manner in which he is worshipped. The Antients, however, were a Christian body and its constitutions contained many Christian references. The Grand Lodge of Ancient York Freemasonry in the Province of Pennsylvania was formed on February 13, 1760 and warranted on July 15, 1761. Following the American Revolution, the Provincial Grand Lodge declared itself independent and transformed itself in 1786 into “The Right Worshipful Grand Lodge of the Most Ancient and Honorable Fraternity of Free and Accepted Masons of Pennsylvania”. Both Grand Lodges grew rapidly in Europe and in America during the following fifty years. Finally, on St. John’s Day, December 27, 1813 reconciliation took place in London at Freemasons’ Hall. The Duke of Kent retired as Grand Master in favor of the Duke of Sussex who was elected Grand Master of the United Grand Lodge. A united Freemasonry agreed that it would no longer have religious disagreements and would welcome and admit worthy men of all creeds and every race. Lodge # 62, our Mother Lodge, has the honor of being the oldest Masonic Lodge in Berks County. Lodge # 62 was constituted on April 9, 1794. Lodge # 66 of Caernarvon Township was warranted on June 1, 1795. This lodge moved to Morgantown in 1823 and later had its warrant vacated in 1837. After fifty years of growth in Lodge # 62, five brethren with 2 others withdrew from their respective lodges and petitioned the Grand Lodge for a warrant, which was granted. 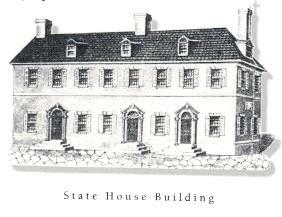 Chandler Lodge's first meeting place was in the "State House" building on the northeast corner of 5th and Penn Streets. It had been the meeting place for Lodge 62 from 1806 to 1847. This particular building was erected in 1792 and later destroyed by first in January of 1872. Due to the layout of the structure, the station of the Worshipful Master was physically located in the North in this room, with the Senior Warden in the South and Junior Warden in the South. The altar, which rested on a carpeted floor, was in the middle of the room with three candlesticks arranged about the altar in the form of a right triangle. A beautiful chandelier with six oil lamps was hung directly over the altar. The Worshipful Masters chair was of an old-fashioned pattern with a high hickory stick back and a heavy headboard. Carved and gilded on the headboard was an elaborate rising sun. Over the pedestal was a handsomely decorated canopy supported by two columns. The walls of the lodge were decorated with photos in exquisite frames featuring Washington, Lafayette and members of the Grand Lodge of Pennsylvania. Chandler Lodge made a most favorable impression upon its candidates and visitors alike! John O.D. Lilly, as I mentioned, was Chandler Lodge's first Worshipful Master at the ripe old age of 26! He was born in Yates County, New York in 1822. He moved to Carbon County, PA after his schooling and learned to be a machinist; eventually being made a foreman before his being of legal age He came to Reading and became a foreman in the P&R Shops. He was made a Mason in Lodge 62 in 1847 and then withdrew from Lodge 62 to assist in founding our lodge. In 1849, after his tenure as the first Worshipful Master of our lodge, he moved to Madison, Indiana and was appointed master mechanic of the Madison and Indiana Railroad, the first railroad in Indiana. PM Lilly served in the Civil War as a part of the 68th Indiana Volunteer Infantry. He was appointed master mechanic of the US military Railroad Service, was given the rank of Colonel and stationed in Philadelphia for the duration of the war. Shortly before the war broke out, PM Lilly founded the Lilly Varnish Manufacturing Company in Indianapolis, Indiana, when he partnered with Henry Mears who had been operating a small manufacturing shop at the time. PM Lilly continued to run the company until his death in 1888 when he was killed by a passenger train while visiting his brother, General William Lilly, who was also a member of Chandler Lodge. Today known as Lilly Industries, the company is still headquartered in Indianapolis, has revenues of nearly $1,000,000,000 dollars, 2,200 employees and over 15,000 worldwide customers. But who was Joseph R. Chandler; the man whom this lodge is named for? PGM Chandler was born in 1792 in Massachusetts and became a schoolteacher. Brother Chandler was entered, passed and raised in Colombian Lodge in Boston, Massachusetts between October 1813 and January 1814. He and his family relocated to Philadelphia in 1815. He became a published author when in 1821 he published a book entitled “Grammar of the English Language.” In 1822 he became a member of Phoenix Lodge # 130 under the Grand Lodge of Pennsylvania and associated himself with the U.S. Gazette. In 1825, he became Worshipful Master of Phoenix Lodge for the first time. 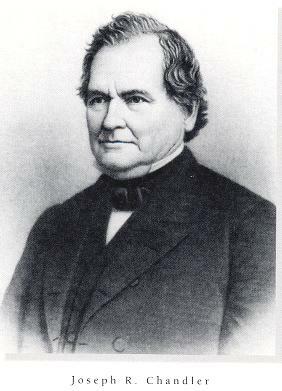 He entered public service in 1832 as a member of Philadelphia City Council. The Grand Lodge of Pennsylvania elected him Junior Warden in 1836, Senior Warden in 1837 and Deputy GrandMaster in 1838 and 1839. He served 2 terms as Grand Master between December 1840 and December 1842. In 1848 he left Philadelphia City Council and became a US Congressman. Later, in 1858, President Buchanan appointed him as the minister to the Five Sicilies. In the fullness of years, after a life of exceptional usefulness, this man of high character and stainless reputation, distinguished as a statesman and a true philanthropist dies in Philadelphia in July of 1880 at the age of 87. It is interesting to look back nearly 153 years to the time of the formation of Chandler Lodge to see what Reading was like. Reading had only been incorporated as a city just 1 year earlier on March 16, 1847. The population at the time was 13,044. The vast majority of the population lived between Walnut and Chestnut and 3rd and 9th Streets. There were two bridges used to cross the Schuylkill River. One at the foot of Penn Street, which was built in 1815 and one at Bingaman Street built in 1831, both of which charged a toll to cross. Reading had no City Hall until 1870, but it did have a fantastic Court House and new county prison in City Park. The Pottsville to Philadelphia Railroad had been completed for only 6 years and the new invention at the time was, my brethren, the Telegraph! The people led active and busy lives; nearly everyone preserved fruit and boiled apple butter in the fall. Popular foods were sausage, pudding, scrapple, ham and mincemeat. There were no streetlights yet and homes used candles and oil lamps for light. However, things were about to change. The officers of Chandler Lodge laid the cornerstone for the Gas Works and gas was soon introduced for lighting! The end of Chandler Lodge’s first year saw membership grow from 7 to 22 men and the Treasury contained about $125. The beginning of its first full year in 1849 saw Chandler Lodge accept a proposition from Lodge 62 to furnish Chandler with a Lodge room, lights, fuel and a Tyler for $100 per year. This room was on the 4th floor in the Keystone House, a hotel situated on the northwest corner of 6th and Penn Streets. (Yes, this time the Worshipful Master would be located in the East) Later in the year, Worshipful Master John O.D. Lilly announced that he was leaving Pennsylvania for another state. The Lodge adopted a suitable resolution acknowledging him for his hard work in forming the lodge and expressing appreciation for the services had performed on behalf of the Lodge. While 1850 was a fairly uneventful year, excepting for the meeting that instituted our regular Tuesday meetings, 1851 was a noteworthy year in our Lodge. We had a disagreement with Lodge 62 over the number of meetings and the proportional rent which resulted in Chandler Lodge meeting in Odd Fellows Hall from February 1851 to June of 1852 for a rental of $40.00 per year. In July of 1852, we returned to the regular hall at the invitation of Lodge 62 as “being in the best interests of Freemasonry generally”. In 1851, our first charitable contribution was made to the Washington National Monument Society in the amount of $10.00. Also in 1851, the Worshipful Master suggested that some action be taken to reduce the Grand Lodge dues, which he viewed as onerous and subversive. A committee was appointed to communicate with all other Lodges in good standing throughout the state to discuss the propriety of asking for a reduction in Grand Lodge dues. In April, Chandler Lodge received an invitation to be present at the dedication of a new lodge in Pottstown, Stichter Lodge # 254. Brother Milholland engaged an extra car on the P & R to accommodate all at a rate of 50 cents per person. Later in the year, Past Grand Master William Barger attended Chandler lodge, witnessed a 3rd degree and then presented an address entitled “The Principals of Masonry”. 1851 ended after 23 meetings with a total of 111 members. 1852 saw the death of the first Chandler Lodge member, Francis A. Vache. The death was announced and appropriate actions taken. In 1853, Chandler Lodge and Lodge 62 jointly celebrated the Centennial Anniversary of George Washington's initiation into Freemasonry. A musical band played and PGM Joseph R. Chandler himself delivered an address. $30.00 was donated toward building a monumental Masonic Temple in Fredericksburg, Virginia. In February of 1854, a petition signed by seven members was presented to the Lodge for the purpose of opening an "Encampment of Knights Templar". The petition was granted and thus, Demolay Commandery #9 was born. 1855 was a year of good financial fortune for Chandler. The assets of the Lodge totaled nearly $2000.00. Lodge reports record that the Lodge had a prosperous year and also dispensed a great deal of charity to widows and orphans. 1857 saw nine members of Chandler Lodge petition the Grand Lodge for a new lodge to be located in Womelsdorf. Williamson Lodge # 307, named after the then RWGM Peter Williamson, was subsequently born with Brother John M. Stephen as the first Worshipful Master. We have come to the end of the first decade in the history of Chandler Lodge. The lodge was a vibrant and vigorous organization. It had fulfilled all of its Masonic obligations. It had been charitable to those in need, it had assisted the establishment of other lodges and Masonic bodies; single handedly forming the nucleus of the encampment of Knights Templar. Yes, it had its share of disagreements between men of strong character, but ended its first decade in peace, prosperity and harmony. In March of 1862, a fire broke out in one of the rooms in the “American House”. Chandler Lodge had met at the American House, which was on the 4th floor on the southwest corner of 4th and Penn Streets since 1859. Lodge 62, Chandler Lodge # 227, Reading Chapter # 152 and DeMolay Commandery # 9 all lost regalia, books and property in the fire. Chandler Lodge continued to meet in the Odd Fellows Hall that it had occupied earlier. The Worshipful Master feared that Chandler’s warrant had been destroyed in the fire. He applied to the Grand Lodge for a dispensation to continue meetings until a new warrant could be obtained. The dispensation was approved and then the old warrant was found, somewhat disfigured, but not too worse for wear. From January of 1864 comes an interesting story regarding the Worshipful Master’s discretion to admit visiting members from other lodges. At the January 5th meeting, William Y. Lyon’s name was announced as a visitor. The Worshipful Master objected to his entering on the grounds that he was an unsuitable person. Soon, much discussion took place about the right of the Worshipful Master to keep him from entering the lodge. The Worshipful Master put it up for vote whether the visitor should be allowed in or not. The vote was nearly unanimous for his non-admittance with only 2 brothers voting in his favor. William “The Bully” Lyon was not permitted to enter the Lodge. In October of 1864, a communication was received from Chambersburg Lodge # 143. Their property had been destroyed in the War by a late rebel raid and they were applying for relief. A motion was quickly entered, seconded and approved for a donation of $100.00 to help our brothers in need. The mid-1800’s brought increased German immigration to our area and by 1865, more and more of Chandler’s work was being conducted in German. Soon, there was enough demand for a German-speaking lodge. Accordingly, the following members were permitted to withdraw from Chandler Lodge: John George Ziegler, Henry Reager, Adam Heilman, Frederick Schneider, Conrad Kessler, Arnold Mellert and John Becker. 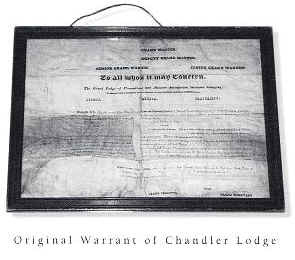 Chandler lodge officially recommended the granting of a warrant to the new Lodge. On June 5, 1866 $100.00 was voted to Teutonia Lodge # 367 to help in defraying their startup costs. The second decade of Chandler Lodge’s existence closed in considerable prosperity. 130 members attended the annual banquet. Chandler assisted at the founding of Vaux lodge # 406 in Hamburg and entertained the proposition to establish a new lodge in Reading, to be known as St. John’s lodge. The 1870's brought a number of charitable requests to Chandler Lodge. The lodge made numerous donations to brothers who were in need including those who lost their tools to the fire at the Fink and Eisenhower Mill. The great fire in Chicago of October 1871 was also cause for charity to be dispensed as Chandler Lodge donated $150.00 dollars to aid the victims of the fire. I found it interesting to note that Chandler lodge donated one barrel of flour, one ton of coal and one turkey to each Masonic widow under its care in 1871. In 1872, $500 was given to help establish the Masonic Home in Philadelphia during the same meeting that a 25th anniversary committee was established to celebrate this lodge's first 25 years of existence. Later in 1872, it was decided that Chandler Lodge would meet in the new Masonic Lodge room on the third floor of City Hall, which was on the northeast corner of 5th and Franklin streets. Appropriate details were worked out with St. John's Lodge # 435 who had secured and furnished the room and the lodge moved once again. On Friday, February 4, 1873, this new room served to host an event that featured all city and county lodges, Williamson, Huguenot, Vaux, Union, 62, Chandler, Teutonia and St. John's for an all day affair which served to properly conduct lodge business and exemplify all three degrees. The hope was to ensure uniformity between all lodges and to promote fraternal friendship amongst each other. Chandler Lodge had its 25th Anniversary a party, a barbecue, at Rose Valley Park, also known as the Schweitzer house, on May 3, 1873 for all members and their families. The total cost was $275.00. In August of 1873, the mood of the lodge turned somber. At the dedication of the new Masonic Temple in Philadelphia, Past Master Samuel McDonnell was killed in accident, details of which I have not discovered. The remainder of the 1870's was a busy period for Chandler Lodge. It amended its bylaws to establish a permanent Charity fund, helped lay the cornerstone for a new Masonic Temple on 6th street, gave birth to yet another lodge, that being Reading Lodge # 549, and continued in the giving of charity by donating $50.00 to the victims of Yellow Fever who lived in the South. The 1880's were a time of worldwide depression and it saw Chandler lodge conducting routine business and continuing its charitable ways, despite poor meeting attendance, by making donations to St. Joseph Hospital, Reading Hospital, Home for the Friendless Children of the City, the victims of an earthquake in Charleston, South Carolina and the Johnstown Floods. The 1890's were marked with much improved attendance and a greater number of initiations. Many requests for charity were again received; many from out of town, and not one request was refused. The highlight of the decade would have to be the purchase of and the cornerstone laying ceremony of the new Masonic Temple on the 100 hundred block of North 5th Street. The ceremony, on June 24, 1897, was attended by nearly 400 members of all the Masonic bodies in the area despite the extreme heat. Chandler Lodge's 50th year, 1898, saw only one remaining Charter member still living. Due to much of Chandler Lodge's finances being used to finance the Masonic Temple, it was decided that there would be no 50th Anniversary party; just a special program at it's anniversary meeting. At the 50th Anniversary meeting in May, the Worshipful Master turned over his station to PM S. E. Ancona, the only living Charter member of Chandler Lodge. PM Ancona was delighted to be in the East and gave a fine speech on the formation of Chandler Lodge, naming every member present at its constitution. He talked highly of Chandler' first Worshipful Master, John O.D Lilly, the amicable feelings between Lodge 62 and Chandler Lodge and of the many meeting places Chandler had occupied in its first 50 years. A number of Past Masters gave similar speeches and all agreed that the spirit of Freemasonry was alive and well in Chandler Lodge. They believed they had set the stage for another prosperous 50 years. would be fair and equitable. Things went from bad to worse when in October 1902 when “Brother Guide” was asked to retire and prepare a candidate for initiation. It seems the required articles for the initiation had previously been removed and taken to the new Masonic Temple. The Worshipful Master was forced to postpone this initiation. Later in October, a special meeting of Chandler Lodge was held and it was reluctantly decided to move the lodge to the new Masonic Temple under the terms set by the Building Trust. As such, the first Stated Meeting of Chandler Lodge was held in the new building on November 4, 1902 with 108 members and 47 visitors present. The next several years were unremarkable in the history of Chandler until we reach the year 1907. It seems that many Masons from the Berks County lodges were involved in a railroad accident on May 11 in the town of Honda, California. Chandler Lodge was the only lodge in Berks County not to have suffered the death of one or more of its members in this horrific accident. A suitable resolution was adopted by the lodge expressing its deepest sympathies to all of those affected by the accident. Chandler Lodge continued to prosper and in 1908, after not celebrating its 50th anniversary properly 10 years before, celebrated its 60th anniversary in grand style at a banquet lasting into the wee hours of the morning. The most revered speaker of the evening was the only living member who was present at Chandler Lodge’s institution, Past Master Sydenham E. Ancona. Later in 1908, a communication was received from Fredericksburg Lodge # 4 of Virginia soliciting for contributions to create a George Washington Masonic Memorial who was a lifelong member of Fredericksburg Lodge. A resolution was adopted and $5.00 was donated to the cause. In August 1908, a petition to the Grand Lodge was read requesting a warrant for a new lodge in our area to be called Isaac Hiester Lodge. Chandler lodge approved the petition that was soon granted by the Grand Lodge. Isaac Hiester Lodge No. 660 was born and grew rapidly. 1910 is the year of our next item of interest. At the December meeting, just after Brother Jacob H. McConnell had been installed as Worshipful Master, Brother Henry price hurried into the lodge and announced to the Worshipful Master that fire had broken out in the basement of the building. The Worshipful Master quickly suspended the business of the lodge and with assistance of the brethren, carried all of the lodge records to the drug store of Brother L. Scott Kemp at 124 North Fifth Street. City firefighters promptly extinguished the blaze and the business of the lodge resumed just after 8:30pm. At noon on Tuesday, September 26, 1911, the cornerstone of Masonic Hall at the Masonic Homes in Elizabethtown was laid by the officers of the Right Worshipful Grand Lodge. It was estimated that 3,500 to 4,000 brethren approximately 10,000 visitors attended this event. The records show that there were few events of historical significance between 1912 and 1917. Two items I would like to note are as follows: The first is that in October of 1917, Chandler Lodge resolved to cooperate with the Masonic Relief Association of the United States and Canada – and to contribute one cent per capita thereto. The purpose of this Association, which was made up by representatives of more than 40 Grand Lodges and 100 Masonic Relief Boards, was to prevent the imposition upon the fraternity by impostors and unworthy members. The second reflects a request from the Right Worshipful Grand Master that all Lodges should cooperate in eliminating waste by holding smaller-scale banquets during war-time. The next decade in Chandler Lodge’s history, 1918 – 1928, reflects the era of great national prosperity our country enjoyed. Chandler Lodge increased its membership to 921, a gain of 369. In 1920 alone, Chandler Lodge initiated 97 members at 22 Extra Meetings. The assets of the Lodge were practically doubled. This decade also saw the end of the first World War, in which 41 of our brethren played a noble role. One of our Chandler Lodge brothers made the ultimate sacrifice. The names of these brave heroes are recorded in our Chandler Lodge History book. In 1918, an appeal from the United States Food Administrator Herbert C. Hoover was read in lodge asking everyone to conserve food and abstain from wheat until the next harvest. Later in 1918, a communication was read from the Grand Master stating that by permission from the Acting State Health Commissioner, Lodge may hold meetings with a limited number of members present for a sufficient amount of time to transact urgent and necessary business for up to one hour. No banquets were to be had until the ban was lifted. These notes from our records didn’t make much sense to me until a brief search of our country’s notable historical events revealed information about the 1918 Flu epidemic. This virus, which is believed to have originated at Fort Riley, Kansas, and spread through the lungs of soldiers heading to Europe for World War I, killed 675,000 Americans. Conservative estimates are that 21,000,000 people worldwide died from this outbreak, but research in the late 1990’s indicates that approximately 20,000,000 people died in India alone. More accurate totals may place the worldwide death toll to between 40 and 50 million people. On a more positive note, 1922 saw the members of our local lodges in addition to the Officers of the Grand Lodge of Pennsylvania lay the cornerstone for the new Northeast Junior High School in Reading. The first 50-year members of the lodge, 14 of them in all, were presented with their Life Membership cards, exempting them from further dues. 1923 was Chandler’s 75th birthday. Chandler celebrated with a wonderful banquet on May 4th featuring fine food, speakers and musical entertainment. During the year, Chandler Lodge also was represented at the cornerstone of the George Washington Masonic National Memorial in Alexandria, VA.
1925 saw Chandler involved in Education yet again when the Right Worshipful Grand Master Samuel M. Goodyear laid the cornerstone of Southern Junior High School at 10th and Chestnut streets in Reading. 1925 also saw Chandler witness the founding of Puritan Lodge # 740. Puritan Lodge, which was originally intended to be called Pilgrim Lodge, was originally made up of lodge members from other towns or cities that now reside in or around Reading. It started with exactly 100 members. J. Edward Billheimer of Potomac Lodge # 5, Washington, D.C. was its first Worshipful Master. Chandler Lodge had now a part in starting 5 new lodges in its first 77 years. Further items of historical interest for the late 1920’s include several events from 1927. These events include Chandler lodge donating $200 to the Mississippi Flood Fund and $400 to the Berks Memorial Endowment Fund in 1927, a stone gavel from King Solomon’s quarries being presented to the lodge by Past Master Harry J. G. Schad and Chandler’s resolution to join with the other Masonic Bodies in the district to establish a Masonic Library and Museum. While the 1920’s were prosperous times, the 1930’s and early 1940’s were anything but. Membership in Chandler Lodge dropped from a peak of 940 members to 728, while the total number of Pennsylvania Masons went from 201,618 to 170,138 – a net loss of over 31,000 members. 1931 was, however, the 200th Anniversary of the Organization of Freemasonry in Pennsylvania. The Grand Lodge celebrated the event in style with representation from Chandler Lodge. Chandler Lodge also celebrated in conjunction with the rest of the 7th Masonic District with a program at the Rajah Temple in late October. 1932 saw the completion and dedication of the George Washington Masonic National Memorial in Alexandria, VA on May 12, 1932 a 12 Noon. A number of brethren made the trip. Price of the roundtrip excursion was $ 4.50. During the 1930’s, with the Great Depression underway, the Worshipful master ordered that 30 members’ past due dues should be paid from the Relief Fund. Meetings were very brief and not well attended. Chandler Lodge continued its ‘Educational’ activities by assisting at the cornerstone laying ceremonies of both Northwest and Southwest Junior High Schools. Later, a program held in observance of the 150th Anniversary of the Signing of the Constitution of the United States. These were certainly tough times for nearly everyone and Chandler’s history certainly reflects the tone of day. It was not until 1939 that things began to take a turn for the better. In 1939, our records show that the Grand Lodge laid the cornerstone for the new Reading Post Office, meeting attendance was very good and there were many entertaining and informative programs. It was in 1940 that Worshipful Master Douglass E. Weidner announced the appointment of a committee to prepare for Chandler Lodge's 100th Anniversary. This was 8 full years ahead of time. Brothers Earl E. Fake and Michael S. Strebig were the members of this committee and they set about their work. At the Stated Meeting on March 3, 1942, the members were instructed as to the proper procedure in the event of an air raid in compliance with the regulations prescribed by civilian defense authorities. This, of course, occurring in the days of World War II. The Lodge also voted favorably on a motion to remit the dues of all members presently serving in our country's armed forces. During those difficult times, Extra Meetings were held in the summer months so that certain candidates could receive their three degrees by special dispensation. 37 Members of Chandler Lodge, their names recorded in our 100 year history book, served in the Armed Forces during World War II. At the February 1945 Stated Meeting, exactly 47 years ago, the flag ceremony was performed for the first time in the Lodge. This ceremony has since become a mainstay in our proceedings. Later in the year, a motion was passed that dues for all members serving in the Armed Forces would be remitted for the duration of the war and six months thereafter. Finally, in 1946, Silver Masonic Medals, suitably inscribed, be purchased and presented to those members who served during World War II. At the end of 1947, Chandler was ending its 99th year of existence and there were nearly 5,100 Freemasons in all city and county lodges. On May 8th, 1948 at 6:00pm in the Rajah Temple Ballroom, Chandler Lodge had a magnificent banquet with much entertainment, good food and fine fellowship. I end this brief history of the first 100 years of Chandler Lodge with a quotation from the speech our then Worshipful Master John D. Glase gave in 1948 at the 100th Anniversary Banquet as his words are ever so appropriate today. "The world today needs the lessons and teachings of Freemasonry more than it ever has needed them before. Friendship and brotherly love and the will to work side by side in peace and harmony are great ideals which we all sincerely hope will become a worldwide creed long before Chandler Lodge celebrates its two hundredth anniversary."